Dear UAEMers all over Europe! 2 weeks ago, we met in Basel and had a weekend full of creativity, discussions, campaigning, innovation and fun. A lot of new chapters started to blossom, a lot of friendships within and between chapters were made to bring forward UAEM's next projects. This issue is dedicated to all those hard working people who have organised this incredible UAEM bonding event, to the people who have planned and carried out their presentations and workshops so professionally, to all of you who have participated and all of you who could not participate, and to all those who share our ideals not just in Europe, but throughout the whole world. We dedicate this issue to the millions of people without access to medicines in the world, and the people trying to change that. 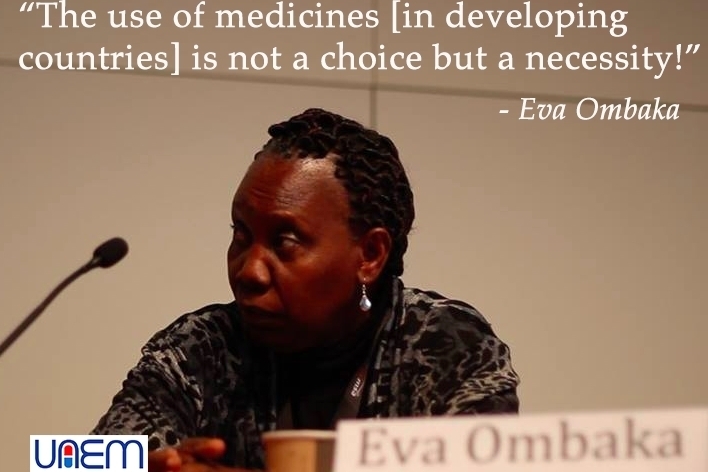 Making medicines for people, not for profit. Two weeks after the conference the various hymns are still echoing in our ears („...who let the drugs out? U – A – E – M!“) and on the streets of Basel we still find some desperately lost orange ballons – or at least pieces of them. Behind the scene, everything went well, too. That’s not self-evident for an event of 200 participants – Thank you all for your contribution! All locations could be given over in good state. Our food sponsors were very happy to hear about the positive outcome and the sustainability platform of University of Basel even wants us on their list of „extraordinary good examples“ for sustainable events! We would like to say again THANK YOU all for your attendance – It was a huge pleasure to see so much motivation and passion within UAEM Europe! Honestly, we didn’t believe that there was still so much energy for the stunt at the end of the weekend, but wow – we were SO WRONG! It was an incredible ending!!! 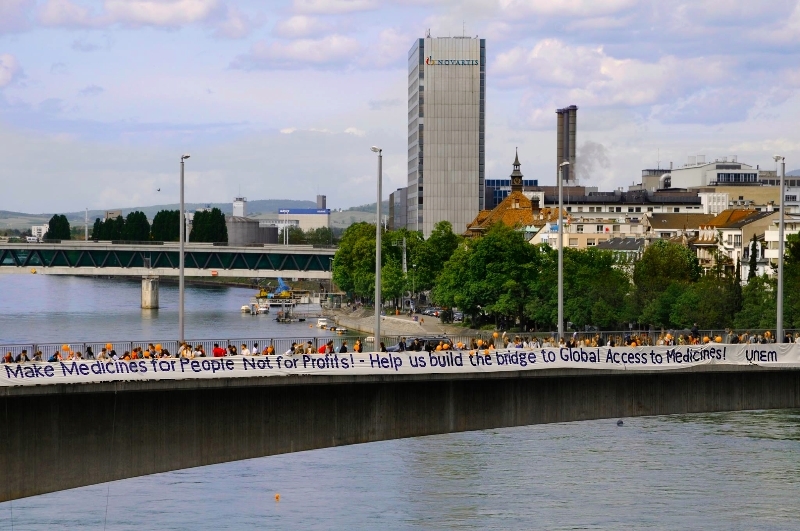 Keep up this inspiring energy, spread the word and let us build the bridge towards global access to medicines – NOW! All around Europe... and the world! Did you miss the conference's lectures or the panel discussion? Here's our selection of our speakers inspirational lectures! Thiru was an external speaker at the workshop “An insiders guide to WHO advocacy: on civil society's role in the fight for access to medicines” and here he tells us more about his workshop and what he thinks about UAEM. What were you here to speak about? I was asked to speak in a workshop in a sort of a insiders guide or perspective on civil society activism in WHO and other UN based organisations like WIPO (World Intellectual Property Organisation) or even the world trade organization. Why did you want to come and speak at this conference? I have only been to one other UAEM conference that was the UAEM Europe conference last year in Copenhagen where I did a workshop on the real cost of drug development. I think it is a really good space, it’s a really good convincing opportunity to exchange ideas and actually reconnect with a lot of my peers and colleagues and I think it is quite a rewarding experience to share a bit of what I do, what activism, and UAEMers can do. I think the conference was really well organized. I participated last year in Copenhagen as well. I think UAEM is important. A few words from Dizz... ECC from the UK, right now dealing with not only one, but three projects! 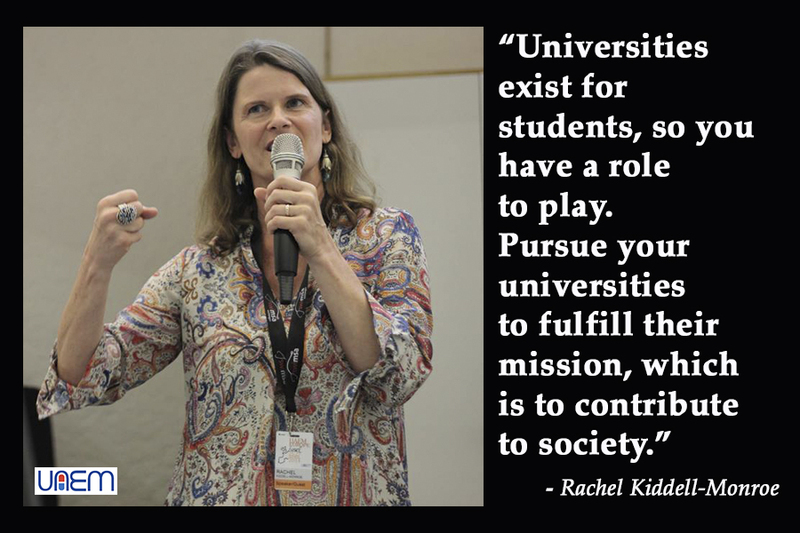 How long have you been involved in UAEM? 11 months. No, sorry, so I have been involved in UAEM for a year and a half but I have been an European Coordinator for 11 months. What is the most interesting fact you have learned from the conference? The most interesting fact I learnt is, I think, that yesterday [April 26th] was intellectual property day which is quite funny. So what can you tell us about your projects? 1. ASTP Proton Project: The main goal is to get ASTP Proton to sign on to social responsibility policy which isn’t just lip-service, but is significantly stronger than the American version (the Statement of Principles and Strategy). And to really put Europe ahead again in equitable licensing of medical inventions. 2. UAEM Evidence: The main goal here is to decrease the amount of time it takes an UAEMer to find a reference they need by a factor of, I’d say, 20. I want to change the 2 hours of looking for something into 5 minutes. I think that is realistic. It is also interesting to keep people in the loop with good, new evidence. 3. UK Report Card [a British version of the American Universities Global Health Impact Report Card]: in the context of UAEM Europe, the aim is to do a lot of the initial exploratory work by taking the American methodology and doing it in a non-American country and see what happens there. We want to provide a pioneering example for any other European country. And again, this should be something that saves people a lot of time, so that they don’t have to go through the same circular struggles again and again. What has been your favorite part of the conference? I think this is gonna sound like a lie, but I genuinely enjoyed the trumpet that woke me up this morning. Or maybe arriving: I was just so freaked out the first hour I was here - this was my first European conference, there so many people here, everyone is so cool, so many countries. I am honestly just hyperactive and freaked-out about how big UAEM Europe is getting. Following Sherlock's footsteps... The Drug Bio Project! Benjamin Ebeling, EC from Denmark, and Rosa Jahn, EC from Germany, have been very active creating the "Drug Bio Project". We asked them what you actually do to become a UAEM detective. Could you sum up your project in a sentence? Ok, one sentence, I'll try. This project will outline, through extensive investigative research, the contribution of universities and public donors to the development of (at this phase of the project) hepatitis C drugs. What is the grand goal of your project? The grand goal of the project is to generate evidence, possibly write academic articles, to use in our advocacy around universities' role in medical R&D. The ultimate goal is to identify drugs which were developed at universities or public institutions and use this data to advocate for lower drug prices. What help do you need from UAEMers? We encourage all UAEMers to join this project. This project has the potential to have a huge impact on the prices of medicines and the whole talk about our medical R&D system. Contact me (be@uaem.dk) and Rosa (rosa.jahn@outlook.com). We are currently looking for chapters who are interested in completing a drug bio as a group. This will be a great way to work together locally while being part of a bigger European project. 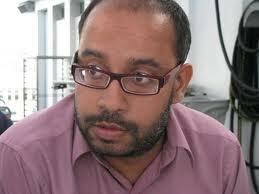 But we also need interested individuals to support us in organising the project. What will you take home from your workshop? Great inputs from participants on important key points of the current methodology. Also, a group of participants worked on a time-line for the project that will be put in to action in the upcoming months. What has been your favourite moment about the conference? I really did like the workshop for the projects. I thought it was a great platform for UAEMers to go from a Saturday full of discussing abstract topics and problematic issues to a Sunday that was hands-on, a "what can I do"-day. It has been amazing to see the UAEMers' engagement and their positive feedback on the projects. Watch the results of the 2014 Annual Member Survey! Almost everyone from UAEM or at least from the European mailing list received about a 100 mails titled "Mentors Wanted" this last couple of weeks. But what is it about? The UAEM Mentoring Program aims to include our new members in UAEM’s work from the very first moment as they start founding a chapter. In doing so we create a network of knowledge transfer, motivation and innovation (without IP!). New members can inspire our work as we inspire theirs- and we can learn from each other. Furthermore chapters can exchange ideas on a personal level and ask questions to a more experienced member. As a mentor you also have the possibility to visit your mentee chapter for startup activities, events and workshops. So far we have 22 Mentors, who are responsible for 32 new chapters in 15 different countries. We managed to find one Mentor for each new chapter until the conference in Basel, in order to connect Mentors and Mentees right from the beginning. We want to provide the possibility for every UAEM chapter in Europe to take part in the Mentoring program. Every chapter, old and new ones, can sign up: as mentors as well as mentees. There is always something new to learn and experiences to share. This conference was also the perfect occasion to meet new people! 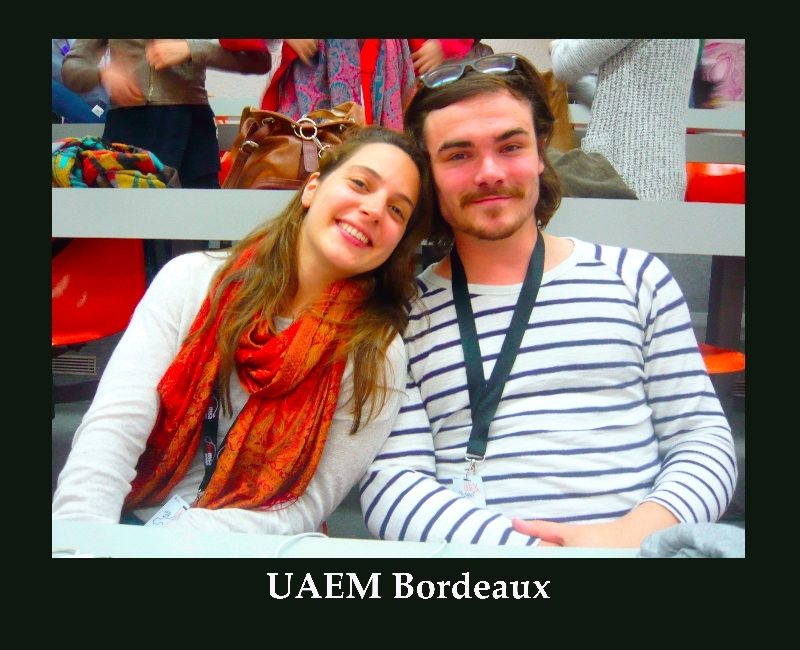 This adventure started a year ago, when some of the Erasmus exchange students brought UAEM to Bordeaux. They returned to their own countries, but the UAEM seeds remain! We have 3 members at the moment (Marion, Steve and Violette), but we are planning some conferences (and perhaps a FIB screening!) to recruit new UAEMers. We are also working on a new chapter in Marseille, we hope the seeds will grow there too! We intend to participate actively to the A2M week too! We are very excited to boost this chapter, and the best moment to do that will be in September, when everyone at the university is looking for an association to join. 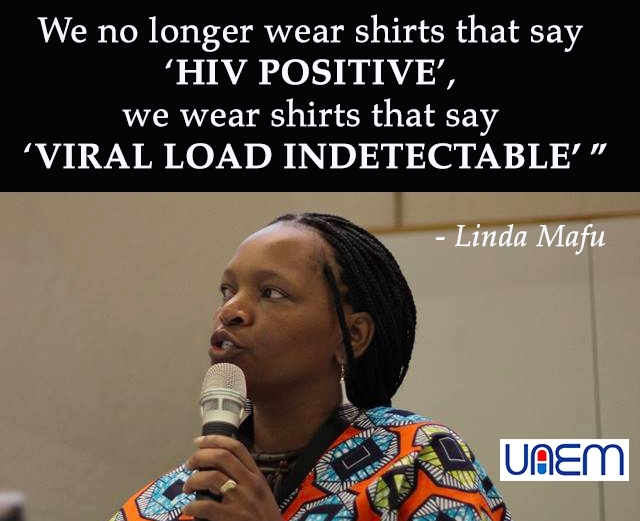 Raising awareness about UAEM and access to medicines are our main priorities." Here is their Facebook page ! How many chapters do you have? 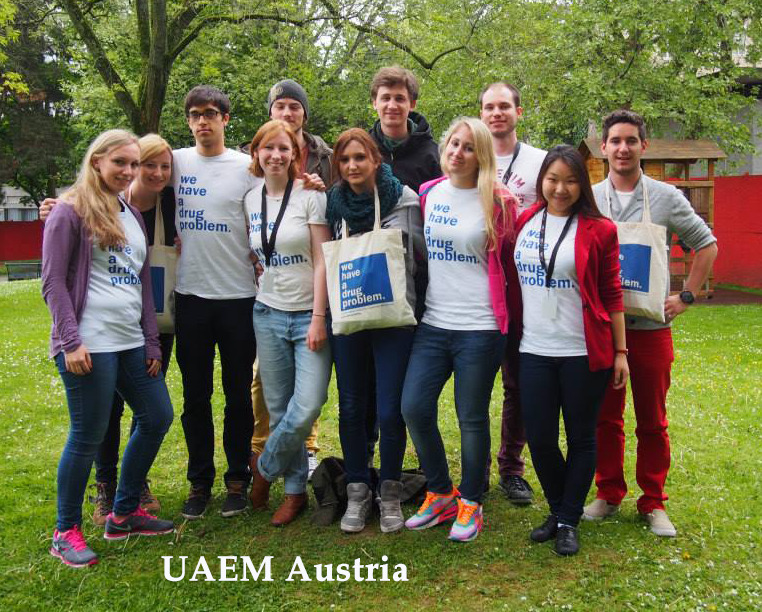 UAEM currently has one chapter in Vienna (usually referred to as “The Cake Chapter“). We are about to establish a second one in Graz soon and working hard to get Innsbruck involved. How many members approx. in total? 20+ people in Vienna alone and we are growing fast! How did UAEM start in Austria? It was Kathi Hawlik who came into contact with UAEM while she was on Erasmus (there must have been cake somewhere). I’m sure she was suprised about how many people were interested to set a chapter up, when she presented the concept to a few of us and got started in October. What are your next goals? We are going to have a huge panel discussion at the 7th of May in cooperation with Doctors Without Borders (MSF), hopefully it is going to be great success. Contact with our TTO at the Medical University of Vienna has been established recently, we got a very positive impression and are looking forward to working together with them in the future. Last but not least, we are working on getting UAEM started in Graz and Innsbruck! Get to know the UAEM Madrid chapter! - Irene Turiel, a Lapland lover with Indian features, ex Berlin-Charité Erasmus student- current UAEM National Chapter coordinator. - Irene Romero, being a real Indian descendent but frenchly engaged, surely the most involved local UAEMer - runs the Med School magazine and is a member of the UAEM European Newsletter team. - Irene Ortiz, indigenous to Spain, just got back from Southeastern Asia after having done an Erasmus exchange in Lyon. She enjoys climbing and learning about different panoramas. - Sara Lorenzo, a mermaid from the Aegean Sea, signed up to join together the Mediterranean Sea with the Atlantic Ocean. She is fascinated by alternative-hipster theater and photography. She will be a part Heidelberg's fauna next year! - Carmen Perianes, another victim of the well-known UAEM Bordeaux flu who spread it out to Madrid, loves the Brazilian ‘Tropicália’ movement and Neglected Tropical Diseases as a matter of fact. She is the chapter's soul and inspiration, and is actually joining the UAEM delegation for the 67th WHA. Would you like to appear in our newsletter? Please send us a picture of your proud members and a text about your chapter! Take a look at our #uaem2014 pretty faces! A special thanks to Dizz Gotham, Yohan Guichoud, Sara Lorenzo, Kathi Hawlik - they kindly shared their photos for this special issue. UAEM will attend the next World Health Assembly (WHA) in Geneva (May 19th-24th)! The focus will be on Hepatitis C, NTDs and CEWG. European Elections 2014: contact your candidates before May 22-25th to ensure UAEM's views get to the Parliament! Useful links - Get involved! Getting started with your chapter? Solution: the Chapter Handbook! What are UAEM's European Projects? Each year UAEM sends a delegation to the World Health Assembly in Geneva, Switzerland. The conference takes place in May and is considered the most important global health conference of the year. It provides a unique opportunity for UAEM to influence the current direction of important WHO discussions. This year's participants are: Jonathan Meldrum (UAEM UK), Elin Hoffmann Dahl (UAEM Oslo), Benjamin Ebeling (UAEM Copenhagen), Carmen Perianes (UAEM Madrid), Onur Kucukerdogan (UAEM Turkey), Stein Schalkwijk (UAEM Utrecht), Olga Kudela (UAEM Poland), Sara Helena Pereira (UAEM Brazil), Sam Mehr (UAEM USA), Justin Mendoza (UAEM North America), Annie Liang (UAEM Montreal), Bryan Collinsworth (Executive Directive UAEM North America). The delegation has already started working together to prepare for the conference through skype meetings, contacting respective county delegates, and identifying partners. During the conference we will try to track down relevant stakeholders for personal meetings, and we will do our best to make UAEM's vision visible in all relevant foras. Stein, from UAEM Utrecht, is attending the 'Youth Pre-WHA Workshop on Global Health Diplomacy and Global Health Governance' by IFMSA, one week shortly before the WHA, which aims to educate and empower youth participation with enhanced knowledge and understanding of global health issues and to develop a streamlined plan of action at the World Health Assembly. Besides, some other UAEMers are coming to the launch of two reports on May 21st at the Graduate Institute in Geneva: ‘WHO Reform and Sustainable Health Financing’, focusing on WHO’s function and global role as a technical agency and policy making body, its regional and country offices, and financing focused on the measures that need to be taken by countries and the global community to provide sustainable financing for health services. Watch out for an update on the success and failures from the delegation in the next issue of the UAEM newsletter! Copyright © 2014 UAEM Europe , All rights reserved.